60 is the new 30. We have the technology! Q. What’s wrong with “growing old gracefully”? A. Nothing, it’s just not for me. I have no intention of growing old and sick in the conventional sense. Instead I will continue to roll back the years from the inside out, never looking or feeling my chronological age, which is different from the younger biological age I’ve created for myself. Further armed with my complete DNA profile, I can monitor known inherited genetic variants that may or may not manifest. Such advantages didn’t exist back in the days when the saying “growing old gracefully” was first coined. Q. Is cosmetic surgery painful? A. Not when properly performed. While there may be moments of discomfort and inconvenience, if it were truly painful and difficult to manage then hundreds of millions of people around the world wouldn’t have it. (And that includes me!) When surgery is not an option for whatever reason, there are nonsurgical alternatives, although they can’t produce the the same degree of dramatic changes. Q. How much surgery have you actually had and how much money did you spend? Reports vary quite a lot. A. I’ve had fourteen (14) surgical operations since 1987. Multiple procedures were combined in some operations. Some sensationalist media like to claim it was different, ridiculously inflated number, sometimes going into the hundreds! However all claims of more than 14 operations (plus numerous non-surgical treatments) are, like so many things in the media, cynically invented to get attention or gain web hits. Nor did I spend anywhere near the preposterous amounts of money claimed in some quarters, more like the cost of a new mid-range car. It’s not necessary to have dozens of operations or spend fortunes to achieve vast improvements. And as Warren Buffet said, “Investing in yourself pays dividends in ways that no property or stocks & shares can.” I witness that on a daily basis. Q. Have you always gone to the same doctors? A. No, that’s not even possible considering I started over 30 years ago. I’ve been to many doctors over the years, regularly moving on as they retired, situations changed or a news options became available. I’m always amazed when random long-retired surgeons call to tell me someone contacted them for surgery because they’d heard somewhere (often mistakenly) that I went to him or recommended him in the 80s, 90s, 00s, etc. My medical recommendations are up-to-the-minute and clients are referred to my current “A-Team.” All referrals are subject to updating and must be re-confirmed with me every 6 months. My unswerving loyalty is to my plan, never to any particular doctor. A lot of patients make the mistake of randomly choosing one surgeon, doctor or dentist then going to him/her forever. Whereas I’ve always cherry picked the best of the best at any given time for each procedure, changing practitioners accordingly. This has been on of the most important keys to my success over more than three decades. Q . Why are natural looking results so important? A. The natural look is proven to be most attractive to observers. Genuinely age-defying, authentically attractive results are the “Holy Grail” of results and require exceptional skills to produce. Whereas obvious-looking plastic surgery is far less challenging for the doctor. The “operated-on” look is outdated, being reminiscent of an era before sophisticated techniques were available. For example, my mature clients don’t end up looking like an old person who’s had a facelift – instead they appear convincingly much younger than their years. Obvious surgery also ages badly, appearing increasingly odd over time. Worst of all, it can be a sign of risky practice where more advanced medical competence is lacking generally. Many of my clients are in the public eye, top executives or otherwise in positions of responsibility & respect who keep their procedures a closely guarded secret. Having credibility and being taken seriously is part of who they are. They also wish to look naturally young and attractive so their worst nightmare would be ending up with a wind-tunnel face, fish lips, cat eyes, veneers that look like ill-fitting dentures, gigantic silicone breasts, over-inflated buttocks or any other unrealistic result that instantly lowers the bearer’s visual I.Q. and credibility. From an anthropological viewpoint, intelligence, attraction and natural selection are intrinsically linked with success. Faking it authentically: Truly excellent results always replicate natural beauty. 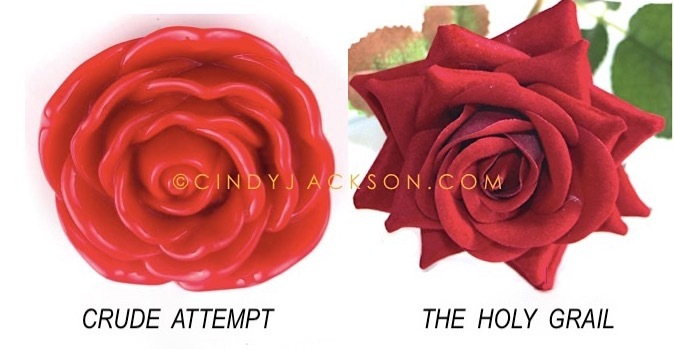 Above: The rose on the left is obviously fake. But you can’t tell if the one on the right is real or not. This illustrates the difference between inferior cosmetic surgery results and the absolute best. Q. There’s so much information on the internet, why not just find a doctor online? A. Because most clients who come to me for help after being botched found their doctors on the internet. You cannot “do your research” in this field simply by surfing the net. The internet becomes more of a bottomless pool of advertising every day. Search results are biased according to your location, browsing history, sponsored content and the SEO of any given site. (Try making identical searches from another computer or location and compare the vastly different results to see this in action.) There’s an ever-expanding amount of hype, aggressive marketing and completely incorrect information mixed in with the odd fact that only serves to confuse and misinform would-be patients, which is the intention a good deal of the time. Furthermore, once something is online it’s online forever (and often copied & pasted repeatedly) so you will also unknowingly come across plenty of obsolete, totally outdated information. Q. What about cosmetic surgery forums? A . See previous question. Although forums can be entertaining and at times informative, it’s well known that they’re also rife with fake reviews, photoshopped pictures, paid promotions and conflicting doctors’ opinions. Even with my vast network and global reach, I don’t know of any patients who actually post on forums, do you? Certainly none of my private clients want their personal photos or details online, knowing that their IP address can always be identified. It doesn’t seem to be something in which your typical cosmetic surgery patient participates. Q. Does anyone else do what you do? A. No, no one else in the world. If you happen to see my intellectual property copied from this site and used elsewhere, please let me know using the Contact Form. It wouldn’t be the first time! Pages from my previous web site have been copied word for word by various unscrupulous individuals attempting to set themselves up in a copycat business, all whom inevitably failed. This job requires an incredible amount of time, ongoing financial investment, dedication and concern for the welfare of others, not merely the ability to copy and paste. Q. Why London and Geneva? A. My enduring trademark style for myself and my clients has always been timeless European elegance – never appearing obvious, overdone or outdated. London and Geneva are where I and my “A-Team” are located, therefore the only places you can get those results. I only recommend doctors that I would entrust my own life and looks to. My clients travel from all over the world for treatment and always enjoy their time in these two magnificent cities. Q. When people come to you for after bad surgery, what are their most common regrets? Another big regret is getting only fair or average results; when the procedure has been performed correctly but the result is ultimately not as beautiful as it could have been. 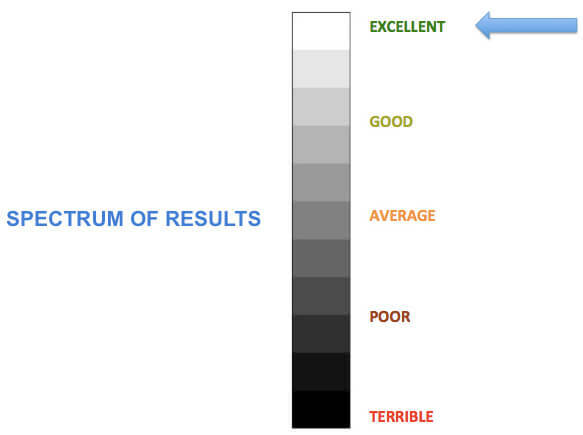 By definition this is actually how the bulk of results turn out on the surgical spectrum. A lot of disappointed patients who turn to me in desperation end up paying twice and having their surgery all over again to finally get the more rarified truly excellent results they wanted the first time. Top end of the spectrum results I specialise in are the exception and never just happen by chance. Q. How important has being a member of Mensa been to your choices of surgery and doctors? A. That’s hard to say. Over the years I’ve heard from so many highly intelligent, very capable people who made terrible errors in judgement with their health and looks by falling for hype and aggressive marketing. I think the combination of being an insider, doing this job full time for over 30 years and having an extensive network of top medical professionals to cross-check with has been more important. Q. Do you know how most people who get botched chose their doctor? A. Yes, it’s a question I alway ask and have extensive data on the subject. Here are some of the top reasons. GOOGLE. Search results are based on keywords, SEO rankings and your location, not medical excellence. MORE SHOWBIZ THAN MEDICAL WEB SITE. If the doctor is more about media exposure than patient care, beware. BEST SURGEONS GUIDES are compiled by tabloid newspapers or fashion magazines. Listings can be bought by PR agents. LOCATION. A famous address (Harley St, Park Ave, Beverly Hills, etc.) does not guarantee safety, efficacy or excellence. ONLINE FORUMS. Run by non-medical business interests, they can have fake reviews, photoshopped pictures, paid promotions and inaccurate information. THE DOCTOR WAS ON TV OR IN THE MEDIA. Fame or TV appearances are no indicators of excellence. Instead they can even be a red flag. SAME DOCTOR WHO DID PATIENT’S LIPOSUCTION WAS CHOSEN FOR NOSE JOB (Example operations) While a surgeon my be good at some procedures, no single doctor excels at them all. THE DOCTOR HAD A GOOD REPUTATION 20 YEARS AGO. It’s a full time job to keep track of who the best doctors are currently. Q. How do you spend a typical work week? A. Whether in the UK or Switzerland, most days I speak to top doctors about different matters most days. Sometimes I observe procedures in the operating theatre. I’ll see a new client or two and spend time following up ongoing clients. 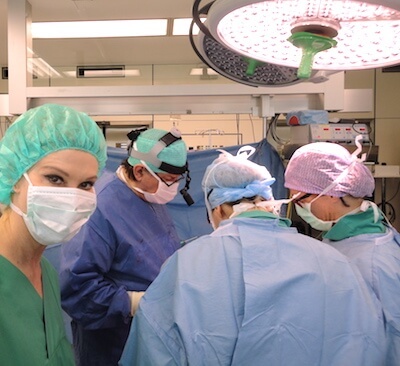 When my clients have surgery, if possible I visit them in the hospital or visit them post-op to see their results. Some weeks I travel to medical conferences, where I’m often a guest speaker. Because I never stop learning, my schedule includes attending scientific or medical lectures. I regularly visit top medical professionals around the world to stay at the forefront of my chosen combined specialties. Then there’s the day to day paperwork, accounts and admin, all of which I do myself. It’s a full week! Observing surgery in the operating theatre. A. No. I have so much passion for what I do and there’s always something new to learn, which also helps keep me young. Since I use my research on a daily basis for my own health, anti-aging and beauty program too, if I retired not only would my clients lose out on such invaluable information, so would I. No one else on the planet connects the dots across these specialities – or puts them into practice every single day both personally and professionally. The cumulative up-to-the-minute knowledge I continue to gain from resources such as medical conferences, lectures, conversations with top doctors and clients (I learn something from every single client) grows in leaps and bounds every year. I intend to benefit from it and offer it to my clients for the rest of my life – which I plan to be long, healthy and of course age-defying! Q. Who is your favourite fashion designer? Most of the time I engage the Steve Jobs “6 identical-shirts-and-jeans” style, adding a colourful scarf or accessories bought on one of my travels. Not being a fashion slave frees up loads of time and money for other pursuits. The casual look is also more youthful. Q. What is your luxury indulgence? A. Travel is one of my passions, which I get to indulge in regularly through my work. I’m blessed to have been all the way around the world and back. Material possessions mean little to me. We all come into the world with nothing and leave it with nothing. Time and freedom are the real luxuries in life and I don’t take either one for granted. Q. YOU DON’T HAVE MUCH PRESENCE ON SOCIAL MEDIA. WHY IS THAT? A. I’m focused on real life. Work takes a lot of my time and concentration. Plus I keep my private life off social media. I’ve never been one to follow the crowd and have nothing to prove. And since I don’t do paid endorsements (social media mainly exists for monetised advertising and exploitation of your personal details), spending precious time trying to attract a multitude of anonymous “likes” and followers makes no sense in my case. It seems to be much the same with most medical professionals, academics and others at the very top of their game. They aren’t always on social media either. My downtime is spent in the great outdoors enjoying nature – far healthier than the current trend of always being preoccupied with a phone or seated in front of a computer screen for hours. Sitting is the new smoking! 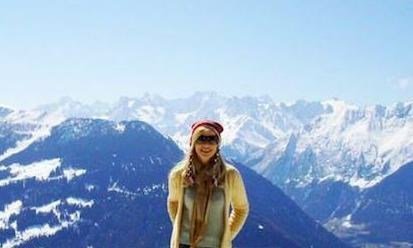 Exploring the Swiss Alps. No internet connection – bliss!